New Mexico resonates with me. I happily dance along its many harmonics as if it is an old familiar place filled with people I’ve known for a very long time. I’ve lived in New Mexico for three years. I was reading a friend’s blog—she is very funny—about being accused of being a hipster. One comment there inspired my comment which got a couple of replies all of which has nothing to do with anything except I was considering another reply/comment of my own having to do with being understandably confused since I live along the famous-and-we-aren’t-going-to-let-you-forget-it-EVER Route 66. I was only trying to be clever and had no actual point to make about it so I didn’t post that comment. 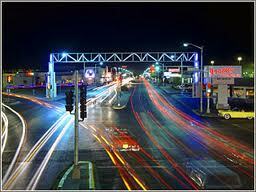 But I started thinking about Route 66 and living in an area where hundreds of small businesses play on that theme. 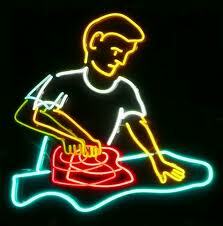 Neon signs. Malt shops. Classic cars. You name it, if it’s “’50’s” many Albuquerquian business folks love to decorate with it, neon-ize it, or hang it up next to a poster of Elvis. I’m sure Route 66 is dotted all across the country with this kind of thing. Oooooh Baby! 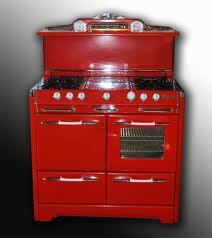 This is a red Wedgewood. Here in New Mexico we have quite a dichotomy going. On the one hand we have a fascinating rich and varied culture of Native American tribes, cities twice as old as the country itself, and a tradition brought here by Spanish and Mexican peoples who traveled the Camino Royale—Royal Road—bringing arts, culture, gold, education and livingness. The spirituality in this state, present in so many different forms, is so rich you can scoop it up with your hands and cleanse yourself with it. In contrast this state is ground zero for all things nuclear. Los Alamos. Atom bombs. White Sands Missle Range. Carved out mountains holding nuclear armament. This is the very invention that can wipe all of us and all our culture, art and spirituality right out. What do you do with a situation like that? There are many answers apparently. Spirituality, art, culture and living traditions abound over here. They loom very large and make a powerful stand to not only survive, but thrive! I camp out here. I help this survive and expand. Very soon we can, if “we” can afford it, get outta town—way, way outta town—and get a fresh perspective on things. We’ve got the Spaceport Authority of New Mexico to thank for that. Spaceport America is located in the Jornada del Muerto desert basin in Southern New Mexico. Sir Richard Branson’s Virgin Galactic is not alone at the spaceport. There’s SpaceX, UP Aerospace (Is United Parcel planning uber-fast package delivery I wondered? No, that would be “UPS”) and Armadillo Aerospace. Commercial space travel is the coming thing. That is pretty creative! 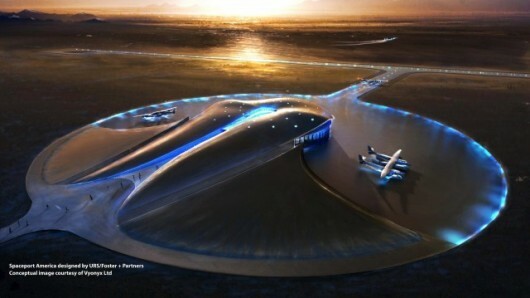 Even this conceptual image of the Spaceport has a little neon touch. The first flight is scheduled for Christmas Day. I wonder if it’s booked? We can try to live a normal, standard American life and ignore the rest. But thank goodness the city of Albuquerque is one of the few places I’ve seen where the unique characteristics of the region haven’t been totally overwhelmed into oblivion by a blanket of fast food and retail chains that homogenize an area to look like any other area of the country. There are still a lot of independent businesses here and a lot of local traditions present and visible. 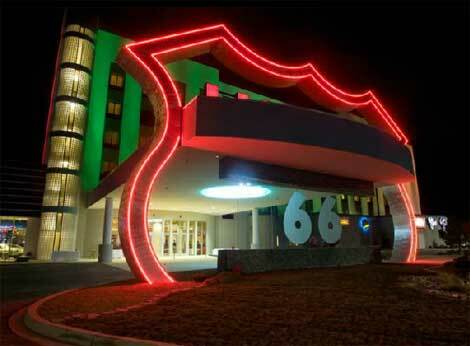 And, we can be Route 66 people and put neon signs up. Neon doesn’t have to be ’50’s nostagia. It can be aesthetic, modern, even futuristic. Welcome to Albuquerque! New Mexico is called the “Land of Enchantment.” Can you see why? The best kind of neon is natural neon! This entry was posted in New Mexico, Places to visit in New Mexico and tagged Albuquerque, Camino Royale, Native American tradition, neon, New Mexico, nuclear ground zero, Spaceport America, Virgin Galactic, Wedgewood stove by mycookinglifebypatty. Bookmark the permalink. This part of the world appeals to me so much, Patty. Can remember our trips down Route 66 way back in the old days, in the back of our parent’s station wagons. The last trip a few years ago was a trip into Albuquerque where I met my friend Melinda and then she went to Santa Fe and I traveled up to a writing workshop in Ojo Caliente with Martin Prectel. Fabulous! That sounds so wonderful, Kathy! We have got to make it go right sometime to meet up! First off, the comment you DID leave was hilarious, so I can only imagine what else you had up your sleeve. Second, thank you so much for the compliment! You are welcome Jules! And Sir Richard seems like a pretty “chipper” sort so maybe he would! We have/had a lot of relatives in Santa Fe and used to go there every summer. I remember Zozobra (?) and La Fonda and still have some turquoise jewelry. Cool! The La Fonda is still there and we always stop in there when we’re in Santa Fe.